POMPANO BEACH, FL – June 12, 2015- Onstream Media Corporation (OTCQB: ONSM) a leading online service provider of corporate audio and web communications, including webcasting, webinar, conferencing and virtual event technology, has reported its financial results for the fiscal year and fourth quarter ended September 30, 2014. Revenues were approximately $4.0 million for the three months ended September 30, 2014 as compared to approximately $4.1 million for the fourth quarter of fiscal 2013. Revenues for the year ended September 30, 2014 were approximately $16.9 million as compared to approximately $17.2 million for fiscal 2013. The year-over-year decrease was primarily the result of a reduction in webcasting revenues, which was partially offset by increased revenues of the Audio and Web Conferencing Services Group. Audio and Web Conferencing Services Group revenues were approximately $2.8 million for the three months ended September 30, 2014, an increase of approximately $76,000 (2.8%) from the fourth quarter of fiscal 2013. Audio and Web Conferencing Services Group revenues were approximately $11.4 million for the year ended September 30, 2014, an increase of approximately $229,000 (2.0%) from fiscal 2013. Consolidated gross margin percentage was 72.9% for the three months ended September 30, 2014, versus 71.9% for the fourth quarter of fiscal 2013. Consolidated gross margin percentage was 72.1% for the year ended September 30, 2014, versus 70.8% for fiscal 2013. EBITDA, as adjusted, for the three months ended September 30, 2014 was approximately $356,000, an increase of approximately $130,000 (57.6%) as compared to EBITDA, as adjusted, of approximately $226,000 for the fourth quarter of fiscal 2013. EBITDA, as adjusted, for the year ended September 30, 2014 was approximately $1.4 million, an increase of approximately $881,000 (186.7%) as compared to EBITDA, as adjusted, of approximately $472,000 for fiscal 2013. Consolidated operating revenue was approximately $4.0 million for the three months ended September 30, 2014, a decrease of approximately $33,000 (0.8%) from the fourth quarter of fiscal 2013. Digital Media Services Group revenues were approximately $1.2 million for the three months ended September 30, 2014, a decrease of approximately $109,000 (8.0%) from the fourth quarter of fiscal 2013, primarily due to a decrease in webcasting division revenues. Revenues of the webcasting division decreased by approximately $76,000 (7.0%) for the three months ended September 30, 2014 as compared to the fourth quarter of fiscal 2013. The approximately 900 webcasts we produced during the three months ended September 30, 2014 was approximately 100 less than the number of webcasts we produced during the fourth quarter of fiscal 2013. The impact on revenue arising from the decreased number of events was partially offset by an increase in the average revenue per webcast event to $1,120 for the three months ended September 30, 2014, which represented an increase of $68, or 6.5%, from the fourth quarter of fiscal 2013. Audio and Web Conferencing Services Group revenues were approximately $2.8 million for the three months ended September 30, 2014, an increase of approximately $76,000 (2.8%) from the fourth quarter of fiscal 2013. The Infinite division, which is part of the Audio and Web Conferencing Services Group, had revenues of approximately $2.1 million for the three months ended September 30, 2014, which represented an increase of approximately $171,000 (8.8%) as compared to the corresponding period of the prior fiscal year. This was in turn due to an 14.9% increase in the number of minutes billed which was approximately 38.5 million for the three months ended September 30, 2014, as compared to approximately 33.5 million minutes for the fourth quarter of fiscal 2013. This increase in the number of minutes billed was partially offset by a decrease in average revenue per minute, which was approximately 5.7 cents for the three months ended September 30, 2014, as compared to approximately 6.1 cents for the fourth quarter of fiscal 2013. Consolidated gross margin was approximately $2.9 million for the three months ended September 30, 2014, an increase of approximately $17,000 (0.6%) from the fourth quarter of fiscal 2013. In addition, our consolidated gross margin percentage was 72.9% for the three months ended September 30, 2014, versus 71.9% for the fourth quarter of fiscal 2013. This increase in percentage was primarily due to a reduction in audio and web conferencing cost of sales, in absolute dollars, even though audio and web conferencing revenues increased. Consolidated operating expenses were approximately $3.0 million for the three months ended September 30, 2014, a decrease of approximately $3.2 million (51.6%) from the fourth quarter of fiscal 2013. This decrease was primarily due to an approximately $3.2 million aggregate decrease in impairment losses on goodwill and property and equipment recognized in the fourth quarter of fiscal 2013, versus no corresponding amounts recognized in the fourth quarter of fiscal 2014. In addition, compensation expense (excluding amounts paid with equity) decreased by approximately $212,000, or 11.1%, for the three months ended September 30, 2014, as compared to the fourth quarter of fiscal 2013. Onstream’s fourth quarter fiscal 2014 net loss of approximately $653,000, or $(0.03) loss per share, was based on approximately 24.4 million weighted average shares outstanding, as compared to a fourth quarter fiscal 2013 net loss of approximately $3.8 million, or $(0.17) loss per share, which was based on approximately 21.6 million weighted average shares outstanding. This approximately $3.1 million improvement in fourth quarter results of operations from fiscal 2013 to fiscal 2014 was primarily due to the $3.2 million reduction in consolidated operating expenses as discussed above. Cash provided by operating activities (before changes in current assets and liabilities other than cash) for the three months ended September 30, 2014 was approximately $153,000, compared to approximately $70,000 provided by operations for the fourth quarter of fiscal 2013. This approximately $83,000 increase was primarily due to decreased operating expenses, including compensation. EBITDA, as adjusted, for the three months ended September 30, 2014 was approximately $356,000, an increase of approximately $130,000 (57.6%) as compared to EBITDA, as adjusted, of approximately $226,000 for the fourth quarter of fiscal 2013. This increase was primarily due to decreased operating expenses, including compensation. 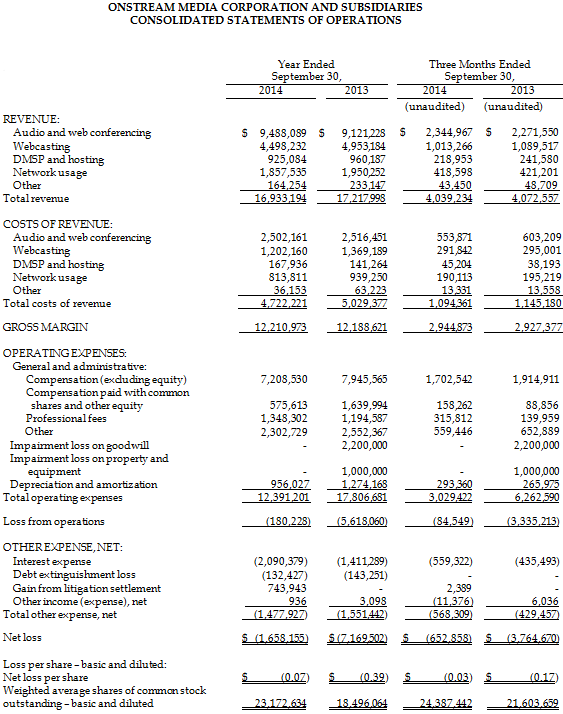 Consolidated operating revenue was approximately $16.9 million for the year ended September 30, 2014, a decrease of approximately $285,000 (1.7%) from the prior fiscal year, due to decreased revenues of the Digital Media Services Group, partially offset by increased revenues of the Audio and Web Conferencing Services Group. Digital Media Services Group revenues were approximately $5.5 million for the year ended September 30, 2014, a decrease of approximately $513,000 (8.5%) from the prior fiscal year, primarily due to a decrease in webcasting division revenues. Revenues of the webcasting division decreased by approximately $455,000 (9.2%) for the year ended September 30, 2014 as compared to the prior fiscal year. The approximately 3,900 webcasts we produced during the year ended September 30, 2014 was approximately 900, or 18.8%, less than the number of webcasts we produced during the prior fiscal year. The impact on revenue arising from the decreased number of events was partially offset by an increase in the average revenue per webcast event to $1,222 for the year ended September 30, 2014, which represented an increase of $152, or 14.2%, from the prior fiscal year. Audio and Web Conferencing Services Group revenues were approximately $11.4 million for the year ended September 30, 2014, an increase of approximately $229,000 (2.0%) from the prior fiscal year. The Infinite division, which is part of the Audio and Web Conferencing Services Group, had revenues of approximately $8.5 million for the year ended September 30, 2014, which represented an increase of approximately $437,000 (5.4%) as compared to the prior fiscal year. This was in turn due to a 12.4% increase in the number of minutes billed which was approximately 148.2 million for the year ended September 30, 2014, as compared to approximately 131.8 million minutes for the prior fiscal year. This increase in the number of minutes billed was partially offset by a decrease in average revenue per minute, which was approximately 6.0 cents for the year ended September 30, 2014, as compared to approximately 6.3 cents for the prior fiscal year. Consolidated gross margin was approximately $12.2 million for the year ended September 30, 2014, an increase of approximately $22,000 (0.2%) from the prior fiscal year. However, our consolidated gross margin percentage was 72.1% for the year ended September 30, 2014, versus 70.8% for the prior fiscal year. This increase in percentage was primarily due to a reduction in network usage cost of sales (proportionally greater than the reduction in revenues) and a reduction in audio and web conferencing cost of sales, in absolute dollars, even though audio and web conferencing revenues increased. 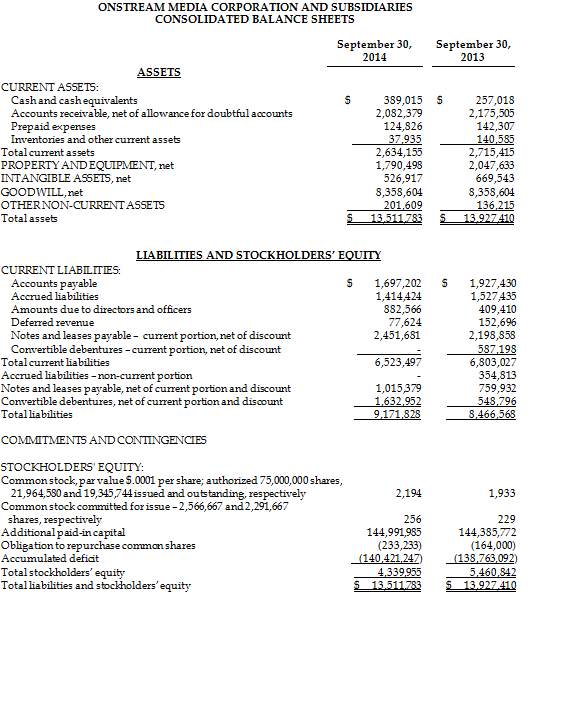 Consolidated operating expenses were approximately $12.4 million for the year ended September 30, 2014, a decrease of approximately $5.4 million (30.4%) from the prior fiscal year, primarily due to an approximately $3.2 million aggregate decrease in impairment losses on goodwill and property and equipment recognized in fiscal 2013, versus no corresponding amounts recognized in fiscal 2014 and an approximately $1.8 million, or 18.8%, decrease in compensation, including compensation paid with equity, as compared to the prior fiscal year. This decrease in total compensation was comprised of an approximately $1.1 million, or 64.9%, decrease in compensation paid with equity, and an approximately $737,000, or 9.3%, decrease in compensation other than amounts paid with equity, both as compared to the prior fiscal year. Onstream’s net loss of approximately $1.7 million, or $(0.07) loss per share for the year ended September 30, 2014, was based on approximately 23.2 million weighted average shares outstanding, as compared to a net loss of approximately $7.2 million, or $(0.39) loss per share, for the prior fiscal year, which was based on approximately 18.5 million weighted average shares outstanding. This approximately $5.5 million improvement in results of operations from fiscal 2013 to fiscal 2014 was primarily due to the $5.4 million reduction in consolidated operating expenses as discussed above. Cash provided by operating activities (before changes in current assets and liabilities other than cash) for the year ended September 30, 2014 was approximately $529,000, compared to approximately $46,000 used in operations for the prior fiscal year. This approximately $575,000 improvement was primarily due to decreased operating expenses, including compensation. 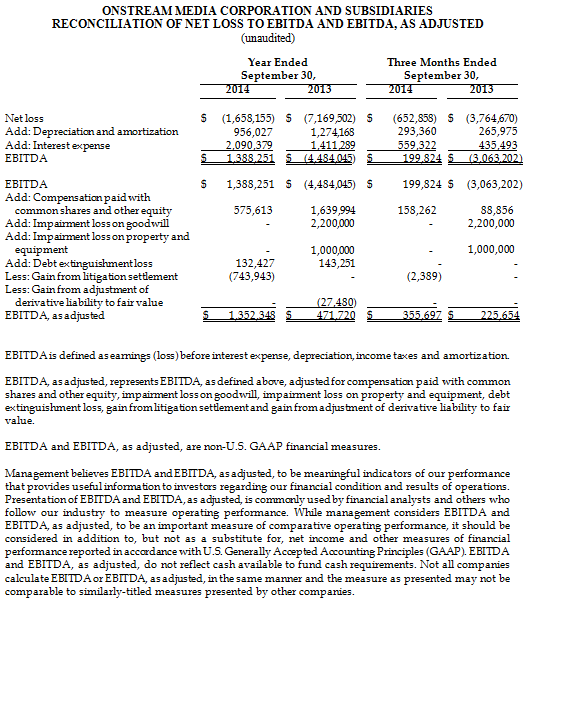 EBITDA, as adjusted, for the year ended September 30, 2014 was approximately $1.4 million, an increase of approximately $881,000 (186.7%) as compared to EBITDA, as adjusted, of approximately $472,000 for fiscal 2013. This increase was primarily due to decreased operating expenses, including compensation. EBITDA, as adjusted, for the year ended September 30, 2014 did not include the benefit of an approximately $744,000 non-cash gain from a litigation settlement reflected in Onstream’s results of operations for the year ended September 30, 2014. Because of the timing of the release of these results and the filing of the related 10-K, Onstream’s leadership team will combine its conference call discussing the financial results for the period ended September 30, 2014 with a discussion of the financial results for the first and second quarters of fiscal 2015, the three month periods ended December 31, 2014 and March 31, 2015.The time and date of that combined conference call will be announced by us shortly before the second quarter fiscal 2015 10-Q is filed. Interested parties may listen to the presentation live online at https://www.webcaster4.com/Webcast/Page/1/5537 or by calling 1-888-645-4404 or 1-862-255-5395 (toll). It is recommended to dial in approximately 10 to 15 minutes prior to the scheduled start time. An audio rebroadcast of the conference call will be archived for one year online at https://www.webcaster4.com/Webcast/Page/1/5537. Onstream Media Corporation (OTCQB: ONSM), is a leading online service provider of corporate audio and web communications, including webcasting, webinar, conferencing and virtual event technology. Onstream Media’s innovative webcasting platform has recently been ranked #1 by TopTenREVIEWS. The company's video streaming, hosting and publishing platform - Streaming Publisher - provides customers with cost effective tools for encoding, managing, indexing, and publishing content to the Internet or virtually any mobile device. To date, almost half of the Fortune 1000 companies and 78% of the Fortune 100 CEOs and CFOs have used Onstream Media's services. Select Onstream Media customers include American Honda, Dell, GE Capital, Georgetown University, IRS, HBO Latin America, HubSpot, PR Newswire, Stanford University, Twitter and the U.S. Department of Agriculture. Onstream Media's strategic relationships include Akamai, BT Conferencing and Trade Show News Network. For more information, visit Onstream Media at http://www.onstreammedia.com or call 954-917-6655. Certain statements in this document and elsewhere by Onstream Media are "forward-looking statements" within the meaning of the Private Securities Litigation Reform Act of 1995. Such information includes, without limitation, the business outlook, assessment of market conditions, anticipated financial and operating results, strategies, future plans, contingencies and contemplated transactions of the company. Such forward-looking statements are not guarantees of future performance and are subject to known and unknown risks, uncertainties and other factors which may cause or contribute to actual results of company operations, or the performance or achievements of the company or industry results, to differ materially from those expressed, or implied by the forward-looking statements. In addition to any such risks, uncertainties and other factors discussed elsewhere herein, risks, uncertainties and other factors that could cause or contribute to actual results differing materially from those expressed or implied for the forward- looking statements include, but are not limited to fluctuations in demand; changes to economic growth in the U.S. economy; government policies and regulations, including, but not limited to those affecting the Internet. Onstream Media undertakes no obligation to publicly update any forward-looking statements, whether as a result of new information, future events or otherwise. Actual results, performance or achievements could differ materially from those anticipated in such forward-looking statements as a result of certain factors, including those set forth in Onstream Media Corporation's filings with the Securities and Exchange Commission.